Grub2 config file may need to be re-generated after changing Grub2 configurations such as configuration changes and setting default boot entries. 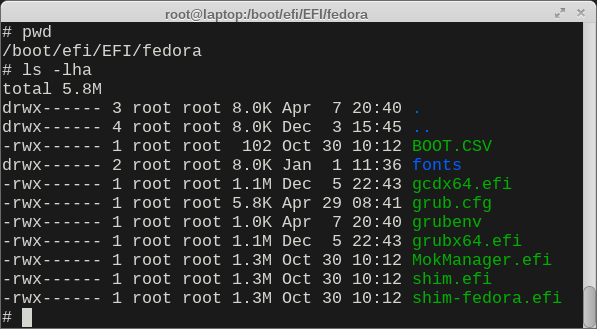 The Grub2’s config file may be at different locations depending on your Linux distro and whether your Linux is booted in BIOS or UEFI mode. This makes regenerating Grub2 config file not easy for Linux users especially beginners. In this post, I will introduce a way that should be portable and easy to use. This method is tested on Fedora and will likely work on RHEL / CentOS / Scientific Linux . For Ubuntu users, please check the “Notes for Ubuntu users” at the end. We provide a script grub2-regen-cfg.bash that you can directly use to regenerate the Grub2 config file. Depending whether your Linux systems is under BIOS or UEFI mode, we choose different config file locations. The files under /etc/ is the most portable location as far as I know as some Linux distros may change the default location that grub2 choose to store the config files under /boot/. Ubuntu and its derived distros have a useful script named update-grub and you can use it to update your grub configuration file by running sudo update-grub. Note that if the /etc/grub2.cfg or /etc/grub2-efi.cfg is not a softlink to the configuration file under /boot/grub2/, you may manually copy the files to the correct location or re-construct the soft link structure.